Gomadic Compact Multi External Battery Charge System designed for the Canon Powershot N. USB, Car and Wall charging connections by Gomadic at Nebula Fia. MPN: UBC-6542. Hurry! Limited time offer. Offer valid only while supplies last. Never let your Canon Powershot N battery go dead again with the Gomadic Complete Portable External Battery Charging Kit for the Canon Powershot N.
Never let your Canon Powershot N battery go dead again with the Gomadic Complete Portable External Battery Charging Kit for the Canon Powershot N. This comprehensive travel solution includes a Gomadic Wall Charging Adapter, Car Charger and USB charging cable to safely and efficiently charge your Canon Powershot N battery from virtually anywhere. Forget to charge the battery last night? No problem. 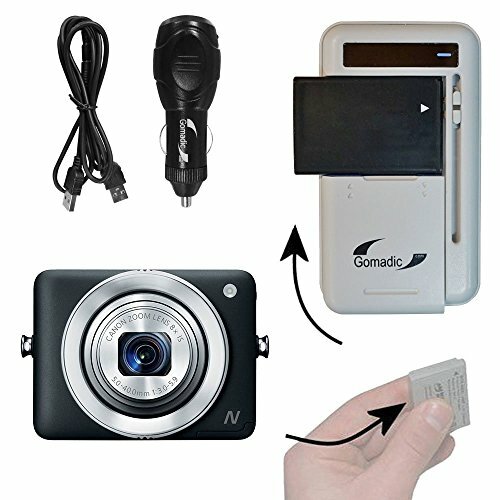 With the Gomadic External Battery Charger you can plug it in for a quick charge, charge it in the car on your way to work, or connect it to your computers USB port. Like all Gomadic products, this charging kit is backed by the Gomadic Lifetime Warranty. Intuitive color coded LED light indicators display when the battery is properly connected, in charging state, and fully charged. Super easy to use! Fast, light weight, flexible and very compact form factor. Advanced internal circuitry protects from power surges, accidental reverse polarity, and overcharging.